A first experience for Little Miss A this week - ice skating! Occasionally Little Miss A has mentioned that she'd like to go ice-skating but then she saw an episode of Charlie & Lola recently called 'I Really, Really Need Actual Ice Skates' and she's mentioned wanting to go a lot since then. After a bit of research, I was delighted to find that the Silver Blades Ice Rink in Altrincham (just half an hour from us) offer Parent & Toddler Sessions. Called the Penguin Club, they have lots of toys on the ice including sledges, ride on toys and trikes. I think Little Miss A and her Daddy tried every single one of them out! For the price, it is a great session. It's just £5 for an adult and a child with skate hire included. The session lasted an hour and a half. There were just 2 other toddlers there so no arguments over the toys! The added bonus was that the bar area was available to parents with refreshments (free) and some toys, so when Little Miss A needed a bit of a rest from being on the ice we took her into this area for a drink and biscuit. Then she was ready to hit the ice again. Mr MoaB did well to stay on his feet with just one spectacular tumble! When asked what her favourite part of the day was, Little Miss A says "Daddy falling over"! He's just glad I didn't get it on camera! The only real negative was that we were subjected to Celine Dion on the sound system for the whole session. I'm guessing this was for the experienced skaters to listen to but a bit more variety of tunes would have been nice! 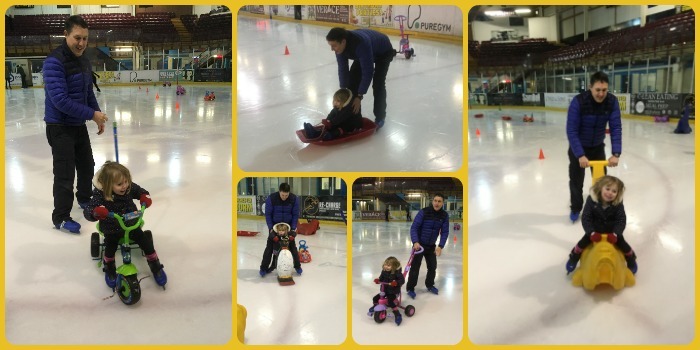 It's well worth checking out if your local ice rink offers similar Toddler Sessions. The Penguin Club at Silver Blades runs during term term only. I think these sessions are really good value and we'll definitely be returning. I'm worried Little Miss A may have the skating bug now! What brilliant fun, we tried ice skating with Josh last year and he loved it, as long as each of us was holding both hands he was going quite fast. It's going to be my turn to take her on the ice next time. Think I'll end up falling over a few more times than her Dad did, just by trying to keep her upright! I know! I think they should have adult sessions with lots of fun toys and things to ride on! Not fair!